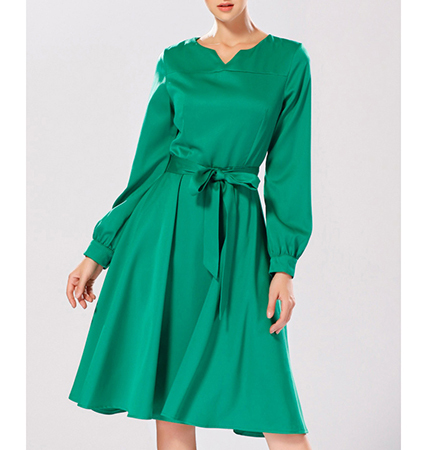 This 1950s retro style midi dress features a generously full skirt to accent the well-defined waistline. The bodice is expertly fitted and features a round neckline with a vee notch. The sleeves are long and moderately full. The dress features a matching self tie belt that is adjustable. It zips up the back with a long, hidden zipper. This garment is created from a high quality cotton-poly blend that has a beautiful sheen. It is presented in a lovely medium green shade. The length stops just below the knee. We recommend dry cleaning for this garment. It is available in sizes Small, Medium, Large and Extra Large.